Discussion in 'Lighting and Electrics' started by rochem, Mar 19, 2009. This is one of the two master stations we have - one in the booth and one offstage right. There are a number of wall plates with just one button (labeled "Panic") at each entrance to the theatre. The sliders labeled 1 through 5 control different, apparently random combinations of lights, while the M slider is the master controller for all of them. There are tiny lights in the buttons labeled Panic and Take Control which turn green when active, and amber when not active. The only things it turns on are the House Lights, our R40 strips, and one 6" fresnel on the 1st Electric. We have 6 - 6' sections of R40 strips, and we end up needing 40-50 new lamps for every show (2 times per year) just because these things get left on all the time. Does anyone know what this system is called, or how I might go about reprogramming it? What dimmer brand do you have? Sorry, forgot to mention it. 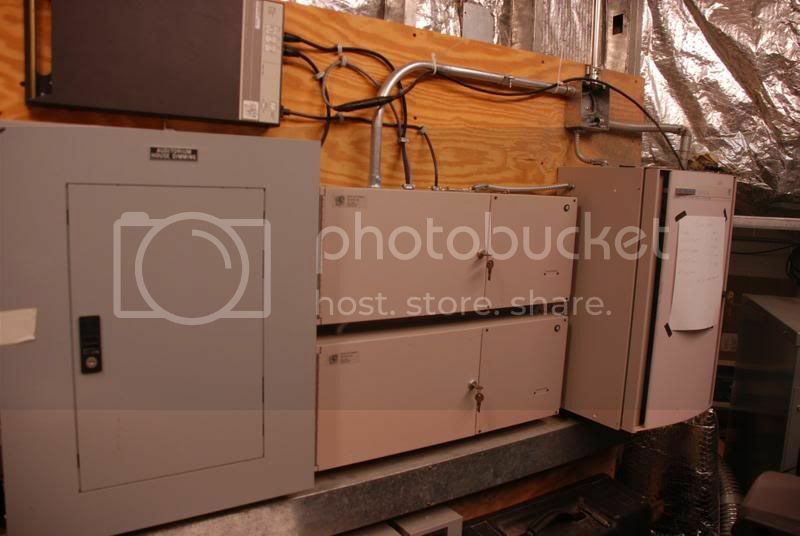 ETC Sensor Dimmers, 2 racks of 96 x 2.4kW. Note that it's not Sensor+, it just says Sensor on the outside of the racks. That would appear to be an Analog Address system, though there is a chance it is a Digital Address system. In either case, you should find somewhere in your facility,most likely the dimmer room, a black or beige wall mounted box with the main processor for it. If it's beige, its an Analog Address. That manual can be found through the Download link at the ETC website. You can open the AAS cover and easily repatch which dimmers are controlled by each slider. If its a black cabinet it is more likely a Digital Address system, and I don't think the manual's online. But you can call ETC Tech Services and tel them your facility name and they can ID it for you. ..... Does anyone know what this system is called, or how I might go about reprogramming it? I'll let someone else chat about the patching and re-programing of this type of panel, I want to focus on the why maybe you shouldn't. If this panel is tied into a panic system, then it should be tied into your fire alarms, it is designed to turn certain lights on to full when ever activated. The number of lights and their level should have been / is normaly dictated by local fire codes. For example my emergency lighting system, in my second stage must output 2 footcandles at floor level when activated. This having been the minimum amount of light required for your average joe to get out of the theatre in case of emergency, according to the Fire Marshal. My point is, you don't want to re-program anything on the Panic system < if it's possible on your rack> Perhaps you could just re-program some of the sliders to only use every other lamp in your strips for works etc. It sounds to me that the problem is not that the architectural system is programmed wrong, but that you really need worklights or something other than show critical fixtures for people to turn on when they just need light on stage. However you also have to consider that systems like that are installed in schools so that lighting can be turned on in a simple manner for assemblies or band rehearsal. You may just need to post a sign at the panel that says something to the effect of "Please turn lights off when you finished using the space." Or go down to the hardware store and find some of those reminder stickers people post that say things like "be green, turn off the lights." The Panic does not automatically turn on when the fire alarm goes off, or at least it hasn't in the past. As I said, there is a wall station at every door with the panic button, so that if you wak into the dark theatre, you can push that and get some lights on. The house lights will still be programmed into the Panic, all I want to do is remove the R40 strips from the Panic button so that they're not running for obscene amounts of time (they frequently get left on overnight/over the weekend/etc.) I'm going to try to convince my TD to buy some L&E Mini-10s or something similar so that we don't keep eating through the R40 lamps, but in the meantime I just want to only program certain R40 circuits into the Panic so I know which ones will need to be changed. We have a Digital Address System at MVPAC and the CPU Boxes are Beige...of course the system hasn't worked in about 10 years. That my friend is ether an Analog Address System (The DAS never had a Slider Panel) and I'm surprised it actually still works. I would personally suggest you get rid of it ASAP. We had a Digital Address System (The AAS's "supposidly" more advanced successor) installed at MVPAC when it was originally built in 1995. It worked for about 3 years, then it died randomly one day, ETC came out to fix it and it worked for one day and then failed again. We have never bothered to get it fixed. The two beige boxes in between the Sensor Rack and the Circuit Panel are our CPU's for our DAS system, they are both screwy unfortunately. We have completely bypassed them now and shut down the system. We are finally trying to replace it with a Unison Architectural Control system which is vastly superior. Contrary to what RonK said, you can actually find the DAS System Manual on the ETC website. Just search for "DAS" in the Downloads section of the ETC website. The Manual is right here! There is also the manual for the Analog Address System there too. To answer the original question: "Pre-Unison System." ...Please call ETC Technical Services and they can help you go through your system information and determine the programmed action these faders have. A few scoops make better worklights than R40 strips and use significantly less energy. Perhaps that could be a selling point, along with the expense and labor of changing R40 lamps. Van, the word "Panic" has been used by stage lighting manufacturers for architectural controls since the 1960s and often has no association with any Life-Safety system. In fact many current codes require an ELTS to bypass the dimmer rack for Emergency Egress Lighting. Thanks for all the info. We had our lighting system redone in 2000 I believe, where they installed all new raceways, new racks, a new board, and possibly this system - although that could have been in place before then, I'm not sure - was ETC still making AAS systems in 2000, or had Unison replaced them by then? Because I'm really not sure how long they've been around. As I said, I'm hopefully gonna be able to convince the TD to purchase some dedicated worklights which we can use rather than constantly replacing R40 lamps (or more commonly, shuffling lamps around so we have two usable colors and putting all the dead lamps into the third circuit). Also, I want to program a simple stage wash into the system so that groups like band and chorus can get simple lighting without needing to screw with the board. I have not used one of those systems for some time, but they do work pretty well. I remember it being kind of a pain to program, but I also remember you could program them without a controller which was nice. I was in the theatre for 6 hours today and found some time to search through the dimmer room for the AAS box, and I did find it. It's definitely an Analog Address System. The totally exposed circuitry is somewhat suspicious, but it definitely has all the buttons that the manual says it should, so I'll look into reprogramming that sometime soon.